Authentic NATURE STONE® Brand Flooring founded the stone and epoxy flooring industry in Ohio in 1989 and employs more than 70 employees who are dedicated solely to the stone and epoxy flooring business. Authentic NATURE STONE® Brand Flooring has installed over 10 million square feet of stone and epoxy flooring. Authentic NATURE STONE® Brand Flooring has served over 25,000 residential and commercial customers (ask to see our customer list). 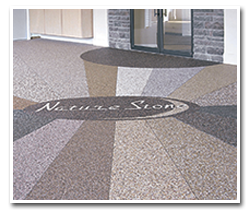 Authentic NATURE STONE® Brand Flooring employs professional and experienced floor covering installers to provide you with unsurpassed quality. Authentic NATURE STONE® Brand Flooring maintains a fully staffed and qualified service department for your convenience. Authentic NATURE STONE® Brand Flooring formulates its proprietary epoxy resin specifically for stone and epoxy flooring. Authentic NATURE STONE® Brand Flooring chemists are owners in the company, so they have a vested interest in creating the very best stone and epoxy flooring products. Authentic NATURE STONE® Brand Flooring has a superior insulation rating (R-value), 2-3 times that of carpeting. Authentic NATURE STONE® Brand Flooring engineered and established the proper standards for epoxy to stone mix ratios (for different types and sizes of stone) to assure optimum floor covering performance. Authentic NATURE STONE® Brand Flooring produces the highest quality topcoat and has integrated it into the floor covering system for maximum performance and customer satisfaction. Authentic NATURE STONE® Brand Flooring warranty is unmatched in the industry.